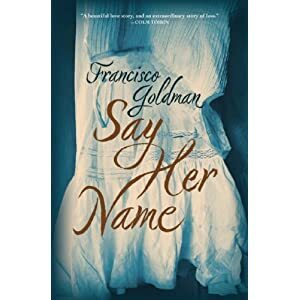 I am reading Say Her Name: A Novel by Francisco Goldman and it is so beautifully written, so captivating that one cannot but help to fall hard for it. Amidst a mass of almost propagandist media plays about what's wrong with single women or why NYC women can't find a man just in time for Valentine's Day, I picked up this book written by a male novelist about the loss of his young beloved wife and I remembered that the capacity to love, to find love, to be loved, to mourn that loss, is neither male or female, but rather deeply woven into our humanity. So much so that it transcends borders and even death. You know I rarely gush here or post personal opinions of books but Francisco Goldman has captured love and heartbreak so eloquently, so completely, so grippingly that I felt I needed to let you know about his book. Suddenly a widower, Goldman collects everything he can about his wife, hungry to keep Aura alive with every memory. From her childhood and university days in Mexico City with her fiercely devoted mother to her studies at Columbia University, through their newlywed years in New York City and travels to Mexico and Europe—and always through the prism of her gifted writings—Goldman seeks her essence and grieves her loss. Humor leavens the pain as he lives through the madness of grief and creates a living portrait of a love as joyous as it is deep and profound. Say Her Name is a love story, a bold inquiry into destiny and accountability, and a tribute to Aura, who she was and who she would've been. Choose Your Own Adventure How The Cave of Time taught us to love interactive entertainment. We are moving toward an ever growing differentiation between the book as object versus content delivery system. The Wall Street Journal takes a look at how Manhattan's legendary Nuyorican Poets Cafe has embraced social media and racked up over 18k Facebook fans, "a 30% increase in online ticketing, a 40% jump in web traffic, double the number of events," and a sweet $10,000-per-month grant from Google," by leveraging social media into their publicity campaign. Great news! I love that place. The Afro-Latin@ Reader focuses attention on a large, vibrant, yet oddly invisible community in the United States: people of African descent from Latin America and the Caribbean. The presence of Afro-Latin@s in the United States (and throughout the Americas) belies the notion that Blacks and Latin@s are two distinct categories or cultures. Afro-Latin@s are uniquely situated to bridge the widening social divide between Latin@s and African Americans; at the same time, their experiences reveal pervasive racism among Latin@s and ethnocentrism among African Americans. Offering insight into Afro-Latin@ life and new ways to understand culture, ethnicity, nation, identity, and antiracist politics, The Afro-Latin@ Reader presents a kaleidoscopic view of Black Latin@s in the United States. It addresses history, music, gender, class, and media representations in more than sixty selections, including scholarly essays, memoirs, newspaper and magazine articles, poetry, short stories, and interviews. While the selections cover centuries of Afro-Latin@ history, since the arrival of Spanish-speaking Africans in North America in the mid-sixteenth-century, most of them focus on the past fifty years. 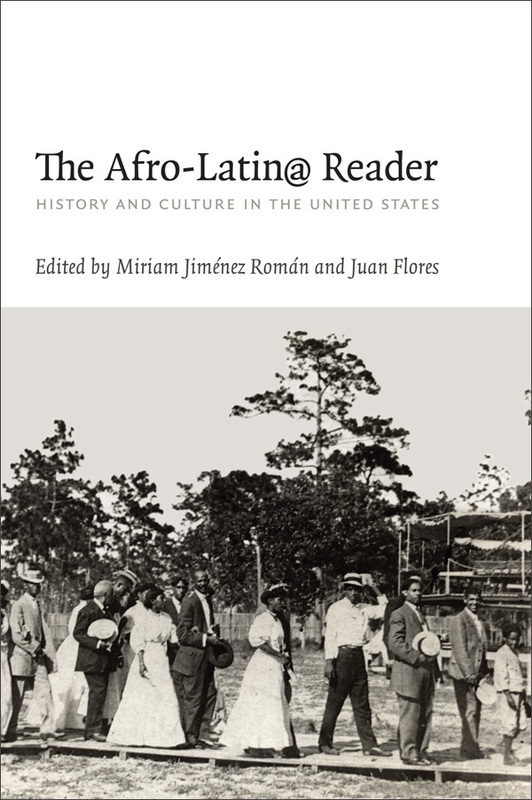 The central question of how Afro-Latin@s relate to and experience U.S. and Latin American racial ideologies is engaged throughout, in first-person accounts of growing up Afro-Latin@, a classic essay by a leader of the Young Lords, and analyses of U.S. census data on race and ethnicity, as well as in pieces on gender and sexuality, major-league baseball, and religion. The contributions that Afro-Latin@s have made to U.S. culture are highlighted in essays on the illustrious Afro-Puerto Rican bibliophile Arturo Alfonso Schomburg and music and dance genres from salsa to mambo, and from boogaloo to hip hop. Taken together, these and many more selections help to bring Afro-Latin@s in the United States into critical view. Stay tuned for a live webcast of Edwidge Danticat in conversation with Julia Alvarez on March 21, 7:00pm EST. Not only will you be able to watch the interview live, but you’ll also be able to chat with other viewers during the event. Can’t tune in to the live webcast? No worries–the entire video interview archived on the site. Labels: Algonquin, Julia Alvarez "Edwidge Danticat" "MacArthur Fellow"
via 454 W. 23rd St and Flavorwire "Interviewed are: DFW (archived), Don DeLillo, Rick Moody, Mark Costello, Michael Pietsch, Bonnie Nadell and Amy Wallace. Originally aired on Radio 3, February 6th, 2011. Runtime 45:04." On April 15th, 2011 'The Pale King', Wallace's final, unfinished novel will be published. Few literary novels have been more eagerly anticipated in recent years. Its great subject is Boredom. Wallace set himself big challenges. Infinite Jest attacked the entertainment industry while trying to entertain and The Pale King engages with boredom as a path toward transcendence. This Sunday Feature is presented by Professor Geoff Ward, author of a literary history of America. He, like many, was convinced Wallace would be the preeminent American writer to reckon with in the years ahead, and was shocked by his tragic early death. He assesses Wallace's legacy, themes and preoccupations, talking to the precursor Wallace admired most, Don DeLillo, and to friends, collaborators and contemporaries such as Mark Costello and Rick Moody. In the company of the writer's sister, Amy Wallace, Ward travels to the Midwest of America where the writer grew up, and considers the impact of place on his imagination. He also talks to Wallace's publisher and editor Michael Pietsch about the difficult task of assembling Wallace's final fragments into The Pale King. The program also contains some rare archive reflections by a young David Foster Wallace, recorded a year before the publication of Infinite Jest, on the role of the writer in an age of media saturation. In 1926, Forrest Ackerman, a nine-year-old misfit in Los Angeles, visited a newsstand and bought a copy of Amazing Stories—a new magazine about aliens, monsters, and other oddities. By the time he reached the final page, he had become America’s first fanboy. He started a group called the Boys’ Scientifiction Club; in 1939, he wore an outer-space outfit to a convention for fantasy aficionados, establishing a costuming ritual still followed by the hordes at Comic-Con. Ackerman founded a cult magazine, Famous Monsters of Filmland, and, more lucratively, became an agent for horror and science-fiction writers. He crammed an eighteen-room house in Los Feliz with genre memorabilia, including a vampire cape worn by Bela Lugosi and a model of the pteranodon that tried to abscond with Fay Wray in “King Kong.” Ackerman eventually sold off his collection to pay medical bills, and in 2008 he died. He had no children. The finalists in the $30,000 Man Asian Literary Prize have been selected and according to the chair of the board of directors of the MALP, David Parker, they "have chosen five very different novels, each in its own way brilliant and captivating, representing the achievements of three major Asian cultures: China, India and Japan." In a small village in China, the Wang family has produced seven sisters in its quest to have a boy; three of the sisters emerge as the lead characters in this remarkable novel. From the small-town treachery of the village to the slogans of the Cultural Revolution to the harried pace of city life, Bi Feiyu follows the women as they strive to change the course of their destinies and battle against an “infinite ocean of people” in a China that does not truly belong to them. Yumi will use her dignity, Yuxiu her powers of seduction, and Yuyang her ambition—all in an effort to take control of their world, their bodies, and their lives. Like Dai Sijie’s Balzac and the Little Chinese Seamstress, Arthur Golden’s Memoirs of a Geisha, and J.G. Ballard’s Empire of the Sun, Three Sisters transports us to and immerses us in a culture we think we know but will understand much more fully by the time we reach the end. Bi’s Moon Opera was praised by the Los Angeles Times, the Minneapolis Star Tribune, and other publications. In one review Lisa See said: “I hope this is the first of many of Bi’s works to come to us.” Three Sisters fulfills that wish, with its irreplaceable portrait of contemporary Chinese life and indelible story of three tragic and sometimes triumphant heroines. A poignant, bitingly funny Indian satire and love story set in a scientific institute and in Mumbai’s humid tenements. Ayyan Mani will not be constrained by Indian traditions. Despite working at the Institute of Theory and Research in Mumbai as the lowly personal assistant to a brilliant but insufferable astronomer, he dreams of more for himself and his family. Ever wily and ambitious, Ayyan weaves two plots: the first to cheer up his weary, soap-opera-addicted wife by creating outrageous fictions around their ten-year-old son; the other to sabotage the married director by using his boss’s seeming romance with the institute’s first female—and very attractive—researcher. Meanwhile, as the institute’s Brahmins wage a vicious war over theories about alien life, Ayyan sees his deceptions intertwining and setting in motion a series of extraordinary events he cannot stop. Unfailingly funny and irreverent, Serious Men is at once a hilarious portrayal of runaway egos and ambitions and a moving portrait of love and its strange workings. Amir Ali leaves his village in Bihar to travel to London with an English captain, William Meadows, to whom he narrates the story of his life – the story of a murderous thug. While Meadows tries to analyse the strange cult of the Indian Thug, a group of Englishmen sets out to prove the inherent difference between cultures and people by examining their skulls – with bizarre consequences.Set in Victorian London, this story of different voices from different places draws intricate lines of connection from the nineteenth to the twenty-first century, between England and India, across individual and cultural differences. Known for his refusal to fit his work into established 'diasporic', subalternist or post-colonialist narrative traditions, in The Thing About Thugs, Khair finally engages with these traditions by subtly and ironically deploying echoes from Victorian literature, ranging from Charles Dickens to P.M. Taylor's Confessions of a Thug and Joseph Conrad's Heart of Darkness. In a crumbling seaside hotel on the coast of Japan, quiet seventeen-year-old Mari works the front desk as her mother tends to the off-season customers. When one night they are forced to expel a middle-aged man and a prostitute from their room, Mari finds herself drawn to the man's voice, in what will become the first gesture of a single long seduction. In spite of her provincial surroundings, and her cool but controlling mother, Mari is a sophisticated observer of human desire, and she sees in this man something she has long been looking for. The man is a proud if threadbare translator living on an island off the coast. A widower, there are whispers around town that he may have murdered his wife. Mari begins to visit him on his island, and he soon initiates her into a dark realm of both pain and pleasure, a place in which she finds herself more at ease even than the translator. As Mari's mother begins to close in on the affair, Mari's sense of what is suitable and what is desirable are recklessly engaged. Have you read any of these? Have a favorite one? Who are your favorite Asian literary authors? 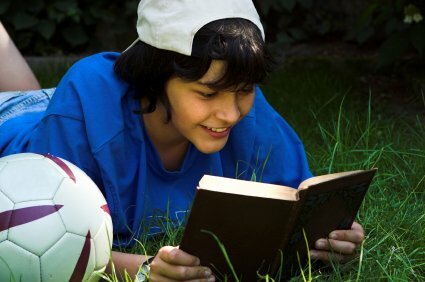 I came across this great list of book for boys while perusing the National Book Foundation website. The list comes to us from my fellow Nuyorican poet, Willie Perdomo and is too good to not share. The Whole Sky Full of Stars by Rene Saldana Jr.
What other books for boys would you also recommend? On the cusps of the discussion over how Egypt managed to turn off the Internet, we received news that the Cuban government has unblocked access to "desdecuba.com, a site that hosts dozens of blogs critical of the Communist government, including Yoani Sánchez’s Generation Y, which has been blocked since 2008. The unblocking of the blogs coincided with an international computer science conference and the arrival of a fiber optic cable connecting Cuba to Venezuela that is expected to dramatically increase the island’s bandwidth." Congrats to Yoani Sánchez on her upcoming Cuban fanbase! Just when sad news of Borders shuttering over 200 bookstores, amNewYork puts out a lovely roundup of small, specialty bookstores in NYC. Another great resource is the annual map of New York City's "Reading Hot Spots" from the National Book Foundation. You can find out more about it in their latest newsletter. Much Love for Animal Rescue’s “It’s Okay To Be A Cat Guy” campaign! Via UrbanDaddy and Shelf Awareness comes news of a cool new spot in Boston. Tres Gatos, offers patrons a nice mix of Tapas and drinks, as well books and music to browse, buy and enjoy. I'll have to check it out when I go to Boston in April. In the meantime, the closet thing we've got here in New York City is the East Harlem's New Vinyl Wine shop (minus the books). All this month, TheGrio.com is also partnering with popular location tracking site Foursquare to offer special offers and "badges" for people who check in at one of more than 100 historical locations relevant to African-American history throughout the month. Foursquare users can unlock a Black History "badge" by following TheGrio at foursquare.com/thegrio and checking in at more than 100 locations across the country that have been identified as historically relevant to black history. Each location will also have a special historical "tip" that will be displayed explaining the historical significance to the black community. Some of the stops include Morehouse College, the Black Soldiers Memorial, and the African American Museum of Dallas. Check out foursquare.com/thegrio to see what spots you should visit. You can also follow TheGrio's 100 on Facebook on Twitter (@thegrio with hashtag #thegrios100). The Grio, which takes its name from the West African word for storyteller,is a breaking news and opinion site dedicated to African-American culture. The Grio is a leading online resource, their efforts inlcude a highlight of "100 History Makers In The Making" and their "GameChangers Media Project" focused on using film to change the negative stereotypes of black men so often seen in the media. You might be familiar with Jane Velez-Mitchell from her show on HLN, Issues with Jane Velez-Mitchell or her appearances on CNN, TruTV, E!, etc., but you might be surprised to learn that this Latina (whose mother is Puerto Rican) is also a member and advocate of the LGBT community. Her new book, Addict Nation, calls for an awakening that leads to a better life for all Americans and our planet. In countries from Brazil to Cuba to Peru and Mexico, the question of race is being discussed and debated, as questions of racial identity are brought to the forefront of national debates, often for the first time. Is it possible that the more than 230 million Latin Americans whose roots reach back to Africa might soon follow the example set by the USA, voting one of their "own" people into power? Is there really pan Afro-American agenda that connects people across Portuguese, Spanish and French speaking countries? Is there really an African way of life in the Americas? An Island Divided In Haiti, Professor Gates tells the story of the birth of the first-ever black republic and finds out how the slaves’ hard-fought liberation over Napoleon Bonaparte’s French Empire became a double-edged sword. In the Dominican Republic, Professor Gates explores how race has been socially constructed in a society whose people reflect centuries of inter-marriage and how the country’s troubled history with Haiti informs notions about racial classification. In Cuba, Professor Gates finds out how the culture, religion, politics, and music of this Island are inextricably linked to the huge amount of slave labor imported to produce its enormously profitable 19th-century sugar industry and how race and racism have fared since Fidel Castro’s Communist revolution in 1959. Episode Three: Brazil: A Racial Paradise? In Mexico and Peru, Professor Gates explores the almost unknown history of the significant numbers of black people—the two countries together received far more slaves than did the United State —brought to these countries as early as the 16th and 17th centuries and the worlds of culture that their descendants have created in Vera Cruz on the Gulf of Mexico, the Costa Chica region on the Pacific, and in and around Lima, Peru. The companion book, Black in Latin America, written by Professor Gates, will be published in 2011 by NYU Press. December 31: 50% OFF ANY ITEM! Don’t Miss the Last of Our 2-Day Deals! January 3: Ring in the New Year with Big Books & BIG SAVINGS! January 6: $10 in BONUS Borders Bucks — Limited Time Only! January 13: WOW! A Wireless eReader Under $100 — 4 Days Only! January 31: FREE SHIPPING — No Minimum Purchase! Stop Shoveling, Start Shopping! Junot Díaz's The Brief Wondrous Life of Oscar Wao won the 2008 Pulitzer Prize for Fiction. 40 East 35th Street. Take 6 train to 33rd ST or any train to Herald Square. For tickets, call Revolution Books at (212) 691-3345, or go online at www.revolutionbooksnyc.org. "An Evening with Junot Díaz", a benefit for Revolution Books, promises to be an unforgettable event. 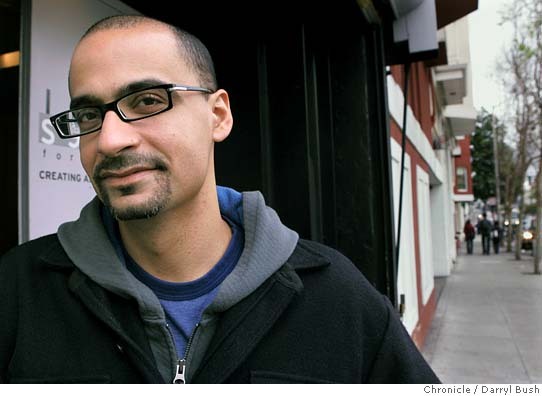 Junot Díaz won the Pulitzer Prize in 2008 for his novel The Brief Wondrous Life of Oscar Wao. Speaking of his novel, Junot Díaz said, "Oscar was the end point (for me) of a larger, almost invisible historical movement—he's the child of a dictatorship and of the apocalypse that is the New World. I was also trying to show how Oscar is utterly unaware of this history and yet also dominated by it." Speaking of the dictatorship of Rafael Leonidas Trujillo in the Dominican Republic from 1930 to 1961, he went on to say, "Trujillo was one of the U.S.'s favorite sons, one of its children. He was created and sustained by the U.S.'s political-military machine. I wanted to write about the demon child of the U.S., the one who was inflicted upon the Dominican Republic." Junot Díaz was born in Santo Domingo, Dominican Republic. "The Brief Wondrous Life of Oscar Wao" won the John Sargent Sr. First Novel Prize, the National Book Critics Circle Award, the Anisfield-Wolf Book Award, the Dayton Literary Peace Prize and the 2008 Pulitzer Prize. He is, also, the author of Drown. * They are one of the rare places you can still get Spanish-language books in Manhattan. While Africans and their descendants have lived in Mexico for centuries, many Afro-Mexicans do not consider themselves to be either black or African. For almost a century, Mexico has promoted an ideal of its citizens as having a combination of indigenous and European ancestry. This obscures the presence of African, Asian, and other populations that have contributed to the growth of the nation. However, performance studies--of dance, music, and theatrical events--reveal the influence of African people and their cultural productions on Mexican society. In this work, Anita González articulates African ethnicity and artistry within the broader panorama of Mexican culture by featuring dance events that are performed either by Afro-Mexicans or by other ethnic Mexican groups about Afro-Mexicans. She illustrates how dance reflects upon social histories and relationships and documents how residents of some sectors of Mexico construct their histories through performance. Festival dances and, sometimes, professional staged dances point to a continuing negotiation among Native American, Spanish, African, and other ethnic identities within the evolving nation of Mexico. These performances embody the mobile histories of ethnic encounters because each dance includes a spectrum of characters based upon local situations and historical memories. ANITA GONZÁLEZ is Associate Professor and Associate Chair of Theatre Arts at the State University of New York at New Paltz. She is the author of Jarocho's Soul: Cultural Identity and Afro-Mexican Dance, and she has published essays in Modern Drama, Journal of Dramatic Theory and Criticism, Community and Performance Reader, and Dance Research Journal. Consider yourself plugged into my mind. Don't blame me if you also become addicted or fall in love with any of the writers. You've been forewarned!